With roughly 30 games to go until the end of the regular season, it's going to be a sprint to the finish line in the Eastern Conference as teams 3 through 10 are separated by just 7 points, with another 3 teams two points back of that. The Penguins currently find themselves sitting in 3rd place in the Metro Division, but they're only 1 point up on 9th place in the conference. In such a tight race, each point is at a premium, and roster moves and lineup choices that maximize a team's talent on the ice are crucial. With so much on the line, Pittsburgh cannot continue to let their second best goalie remain in Wilkes-Barre while an AHL caliber goaltender backs up Marc-Andre Fleury. The Penguins need to ensure they're putting themselves in the best position to win games and make the playoffs by recalling Matt Murray. 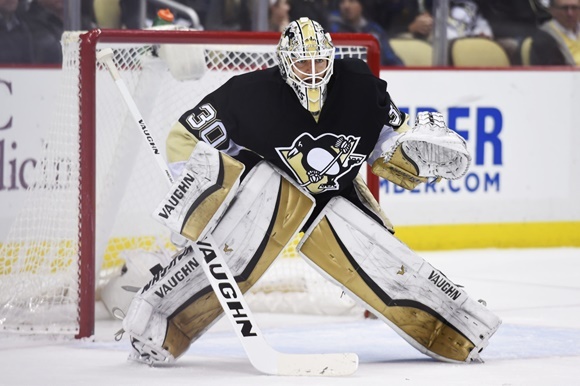 Murray has already gotten a taste of NHL action this season and responded admirably with a 1.72 GAA and 0.938 SV% in 4 starts while clearly establishing himself as the better option as he and Jeff Zatkoff split the starts while Fleury was out with an injury. When Fleury returned, the Pens decided to send Murray to the AHL and keep him there despite better options being available. And Murray returned to a far more challenging situation in the AHL than he faced before being recalled in December. Since then, the Pens have recalled Connor Sheary, Kevin Porter, Scott Wilson, Brian Rust, Tom Kuhnhackl, Derrick Pouliot, and Oskar Sundqvist for varying amounts of time. Considering the fact that Pittsburgh has essentially called up the top half of Wilkes-Barre's roster, the 0.923 SV% and 2.34 GAA that Murray has posted in the 9 games back with the Baby Pens looks impressive. Jeff Zatkoff has a 0.923 SV% and GAA in 12 appearances on the season, but the number belie his level of play and the situations he's found himself in. Adjusting his save percentage by breaking down the location of his shots against the league average, and Zatkoff drops to an adjusted 0.912 SV%, which would correspond to a 3.03 GAA. In addition, his save percentage on the season has been buoyed by an absurd 0.929 SV% while on the PK that screams of a small sample size. The Pens have managed to do a great job in front of Zatkoff by forcing shots to lower danger spots on the ice, but you can't expect a team to continually raise their play when their backup gets a start. The Penguins need to do what's best for the team and recall Matt Murray from Wilkes-Barre. With as tight as the playoff race is, the Pens need to make sure they're putting themselves in the best position to win every night. Murray showed in December that he's capable of jumping into NHL action and performing at a high level. Mike Sullivan has shown that he's willing to play Jeff Zatkoff only as a last resort, when the schedule dictates that the backup be used. It's clear who the better player is, and it's clear that player needs to be backing up Marc-Andre Fleury. Hopefully Jim Rutherford can do what's right and make that roster change. Pittsburgh needs to find ways to stay healthy. No other team in any league has as many problems as this team. Its a joke. Wbs is having one of there best seasons, but as usual pitt ruins that. I know the ahl is for development and the players would rather be in the nhl, but its a joke. Year after year Pittsburgh can't stay healthy.